Penn State's Sustainability Institute (SI) was created to lead Penn State toward the University’s sustainability mission. Through funding and support of the Pepsi Challenge Mini-Grants to Expand the Sustainable Communities Collaborative at Penn State, Penn State Brandywine’s Sustainovation Team has developed three partnerships, develop sustainability-themed engaged scholarship activities to benefit our students scholastically and our community overall. Penn State Brandywine is committed to the goal of promoting and supporting sustainability. 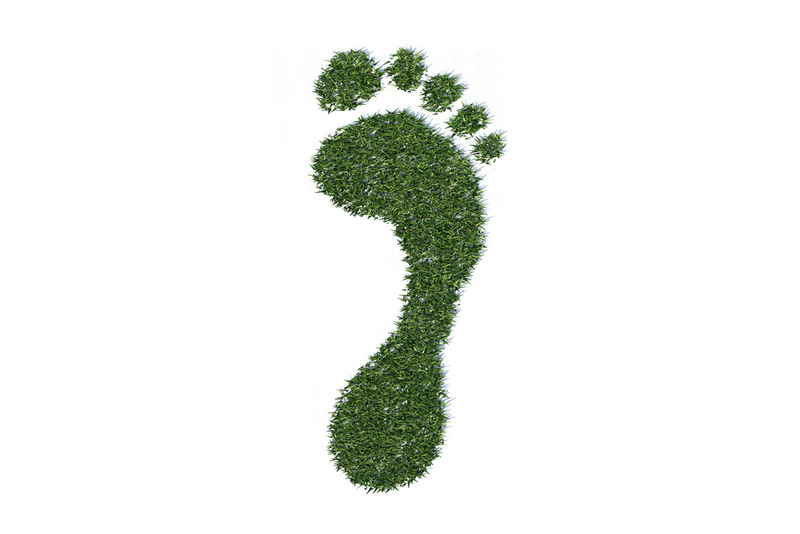 Follow the link, take the quiz, and find our your ecological footprint. Quizzes from National Geographic - see how green you are, and what you can do to be even greener! How sustainable is the food you buy and eat? Are you aware of the issues that crop up every time you pick something off the supermarket shelf? Test yourself on food, fish and other sustainable factors. "Sustainable development is development that meets the needs of the present without compromising the ability of future generations to meet their own needs. It contains within it two key concepts: the concept of needs, in particular the essential needs of the world's poor, to which overriding priority should be given; and the idea of limitations imposed by the state of technology and social organization on the environment's ability to meet present and future needs." This guide is meant to provide resources to explain what it means to practice sustainability on many different levels. Navigate the tabs on the left to find academic articles, videos, magazine articles, books, and organizations that will help you learn more about sustainable practices. "The core of mainstream thinking on sustainability is that all policy and law must be made with an awareness of three separate dimensions of sustainability: economic, social, and economic. 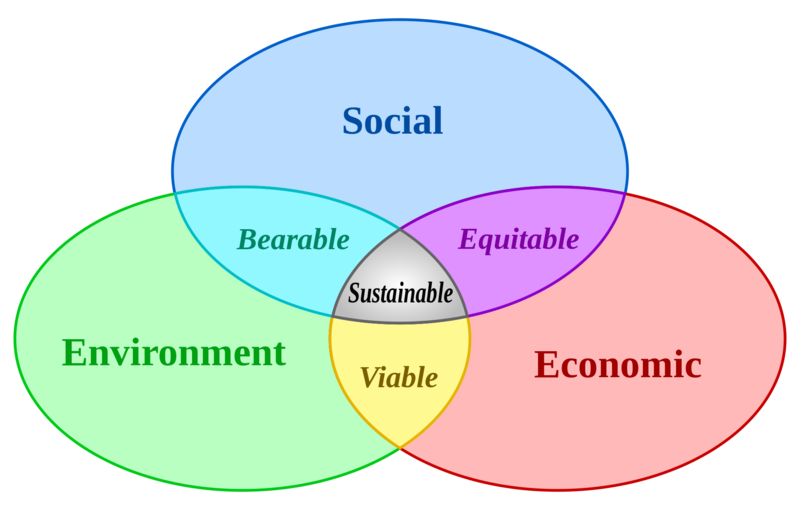 These have been drawn in a variety of ways: as “pillars,” as concentric circles, or as interlocking circles [...] These three pillars are also called the “three Es”—for environment, equity, and economy—or the “three Ps”—for people, planet, and profits. 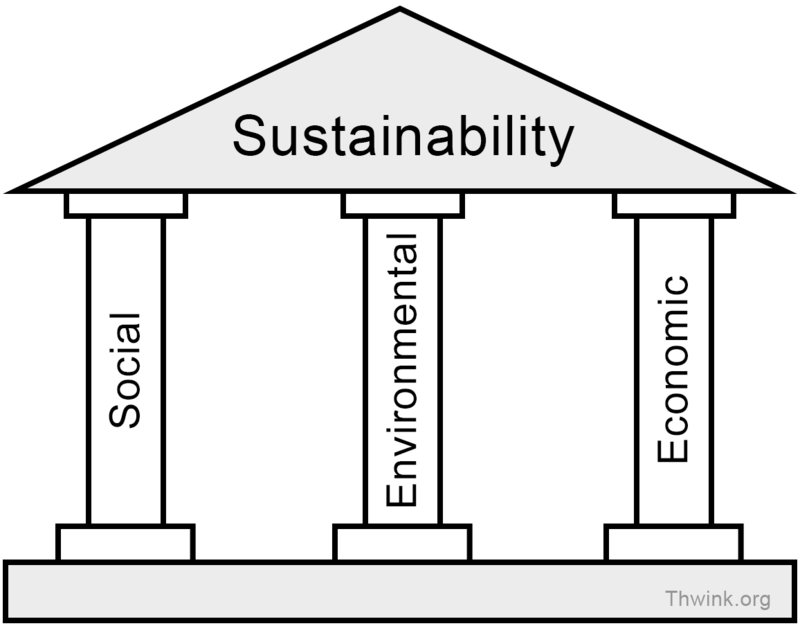 The three pillars concept reminds us that not only is a successful and sustainable economy dependent on protecting the environment and ensuring some degree of social justice but environmental protection may be dependent on achieving a greater degree of social justice (e.g., greater gender equality, educational opportunity, and income security lead to reduced population growth). "